Suppression Systems Inc. technicians, installation and engineering teams are the most experienced in the industry. 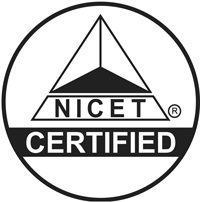 They are NICET (National Institute for Certification in Engineering Technologies) certified and attend continuing education training courses throughout every year. We design and install our systems in accordance with the latest NFPA (National Fire Protection Association) standards. Our installers are licensed electricians and maintain factory certification. Our fire suppression systems are guaranteed to meet or exceed industry standards. Every installation is backed by a comprehensive three year warranty.